Luscious, juicy, ripe, tangy, succulent…tomatoes! Summertime finds Southerners planning picnics, reunions, barbeques and get-togethers with family and friends. Our special occasion meals often include fresh tomatoes. Generally we serve sliced red tomatoes or fried green tomatoes, but they can also be baked, stuffed, grilled, breaded, diced, pureed, or even canned for future use. Any way you slice them, we love our ‘maters! Not only do we love eating tomatoes, many of us enjoy growing them. Whether we are seasoned experts or beginning gardeners, we delight in talking about our beautiful flowers and bountiful crops. Here are a few gardening tips for tomatoes. Your local nursery or garden center can be helpful, too! •	I prefer starting with small plants. Two or three plants can yield a nice crop, so you don’t need a lot. •	Choose a sunny location. A small bed or corner of your yard is perfect, but tomatoes can be grown in large pots on your porch or patio if you get enough sun. They need at least 6-8 hours of sun a day. •	Prepare your soil so they have an environment in which to thrive. I use Scott’s Miracle-Grow Soil and I am liberal with mixing a good deal of it into the garden area. •	Space your plants at least two feet apart. Make sure you give the roots room to grow. Plant them deep enough to reach to the first couple of leaves. Once planted, I pinch off the very bottom leaves. •	You’ll need a tomato cage for each plant. Place firmly over the plant so it can grow up the middle, and the branches will have support. When the tomatoes get growing, the vines can get heavy. I usually keep colorful ribbons or twist ties around to keep the stray branches attached to the cages once they start getting longer. Don’t let branches fall on the ground, this invites disease or bugs. 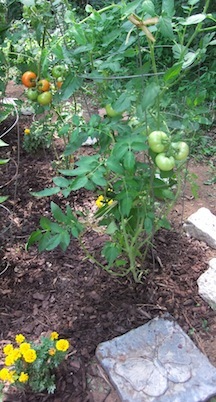 •	I like to plant one marigold between each tomato plant. They keep pests away, and they’re pretty. Basil is also a great companion plant to grow next to tomatoes because they go together in many recipes, and basil repels insects. •	For the first couple of weeks you’ll want to water plants every day. After that, water maybe twice a week. (less if you get rain) You can usually tell when plants need water because they’ll look a little wilted. •	Prune some leaves occasionally. Be careful not to pinch off the ones that have flowers. These little flowers are where your tomatoes will grow. It takes a little practice to determine where to prune. Normally the darker, tougher looking leaves are where you pinch back. 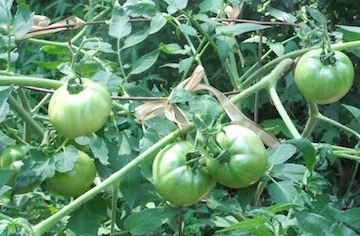 •	Pick tomatoes green to fry, or leave them on the vine until they are ripe and ready to slice. If you don’t have a recipe for fried green tomatoes, one of our most famous Southern cooks, Paula Deen has a fabulous fried green tomato recipe!